Did you know that the poinsettia has a special day all its own? December 12 was set aside by an Act of Congress as National Poinsettia Day. This was the date of the death of Joel Roberts Poinsett (1779 -1851), son of a French physician and the first US Ambassador to Mexico from 1825-29 who brought this native Central American plant to the US. Poinsett, who later founded the Smithsonian Institution, had attended medical school, but was particularly interested in botany. When he visited the Taxco del Alacon area of southern Mexico in 1828, he was fascinated by the brilliant red “flowers” blooming in the tropical highlands during the short days of winter. 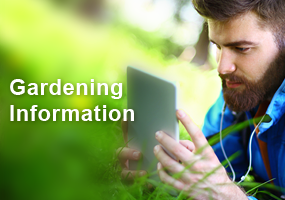 He immediately sent cuttings back to his own greenhouses on his Greenville, South Carolina plantation to propagate. He gave them away to friends and botanical gardens, and eventually a plant made it to Robert Buist, a Pennsylvania nurseryman who is thought to be the first person to have sold the plant under its botanical name, Euphorbia pulcherrima. 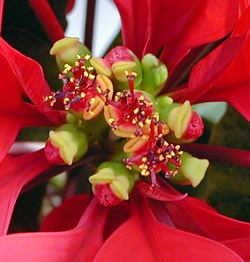 The common name “poinsettia” came into general usage in the mid 1830’s. The tiny central flowers in cyathia, surrounded by colorful bracts. Native to the mountains on the Pacific side of Mexico and Guatemala, this plant in the spurge family (Euphorbiaceae) was used by the ancient Aztecs to make a purplish dye from the colorful “flowers” for use in textiles and cosmetics, and made the milky sap into a preparation for treating fevers. The showy, colored parts of the “flowers” are actually colored bracts (modified leaves) and the real flowers (reproductive parts) are in the little yellow parts (the cup-shaped cyathia) in the center. 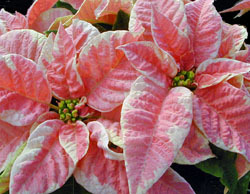 Nowadays, the traditionally red bracts against the dark green leaves make this a favorite as a Christmas decoration, although poinsettias now come in a variety of flower colors including white, cream, salmon pink, rose, scarlet, mauve, and streaked or mottled. There are over 100 varieties of poinsettias available, including some with orange, pale green, cream and marbled leaves instead of the normal bright green leaves. Most commercial cultivars have much wider bracts than the species. This subtropical evergreen or semi-deciduous shrub is somewhat temperamental and rather particular about temperature. It does not do well when temperatures get below 50°F and its lifespan as a container plant is shortened when temperatures go above 70°F. 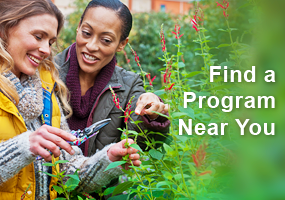 Flowering is initiated by short days and long nights (12-14 hours) in fall, so it can be difficult to get a plant to rebloom unless it is kept in a room without any supplemental light after sunset for about two months in the fall. Any incidental light during this time will interrupt the flowering process. Watering should be reduced during this time. In nature, E. pulcherrima is a very rangy, almost weedy-looking plant, with long, thin, sprawling stems up to 16 feet tall, each topped with colorful bracts. The tree or shrub is covered with leaves in the summer rainy season, but normally flowers when leafless or nearly so in winter. In order to produce short, bushy plants with multiple flowers, growers can apply plant hormones, graft two different varieties to improve branching, or infect plants with a phytoplasma that causes the proliferation of axillary buds. 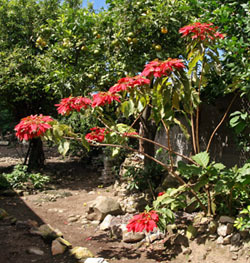 Poinsettia needs moist, well-drained soil, but cannot tolerate sitting in water. Drain any excess water from the pot or saucer it sits in. The leaves and branches of this plant are somewhat brittle and susceptible to breakage. Broken parts are easily rooted in sand to create new plants. The milky sap from poinsettia can be irritating to individuals who are sensitive to the latex, but the plants are not deadly if ingested – it is most likely to just cause vomiting or diarrhea. 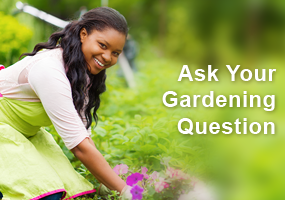 Sap can cause temporary blindness if it gets in the eye, however, so care should be taken when handling these plants. 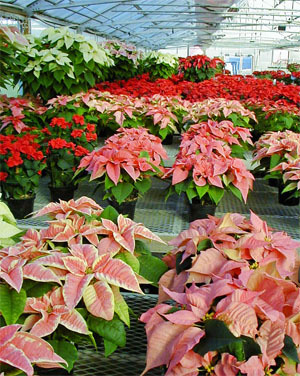 The Paul Ecke Ranch in California has been the premier producer of new poinsettia cultivars for over 75 years. Their website has some great information and lovely color pictures of new and past season’s offerings.